Torches consist of a bundle of loosely twisted threads which has been immersed in a mixture formed of two parts, by weight, of beeswax, eight of resin, and one of tallow. In warm, dry weather, these torches when lighted last for two hours when at rest, and for an hour and a quarter on a march. A good light is obtained by spacing them 20 or 30 yards apart. Another style of torch consists of a cardboard cylinder fitted with a composition consisting of 100 parts of saltpeter, 60 of sulphur, 8 of priming powder, and 30 of pulverized glass, the whole sifted and well mixed. This torch, which burns for a quarter of an hour, illuminates a space within a radius of 180 or 200 yards very well. The tourteau goudronné (lit. "tarred coke") is merely a ring formed of old lunt or of cords well beaten with a mallet (Fig. 10). This ring is first impregnated with a composition formed of 20 parts of black pitch and 1 of tallow, and then with another one formed of equal parts of black pitch and resin. One of these torches will burn for an hour in calm weather, and half an hour in the wind. Rain does not affect the burning of it. These rings are usually arranged in pairs on brackets with two branches and an upper circle, the whole of iron, and these brackets are spaced a hundred yards apart. FIGS. 9 TO 16. - VARIOUS PYROTECHNIC DEVICES. FIGS. 17. - ILLUMINATING ROCKET. A tarred fascine consists of a small fagot of dry wood, 20 inches in length by 4 in diameter, covered with the same composition as the preceding (Fig. 11). Fascines thus prepared burn for about half an hour. They are placed upright in supports, and these latter are located at intervals of twenty yards. The Lamarre compositions are all formed of a combustible substance, such as boiled oil,2 of a substance that burns, such as chlorate of potash, and of various coloring salts. The white composition used for charging fire balls and 1½ inch flambeaux is formed of 500 parts of powdered chlorate of potash, 1,500 of nitrate of baryta, 120 of light wood charcoal, and 250 of boiled oil. Another white composition, used for charging ¾ inch flambeaux, consists of 1,000 parts of chlorate of potash, 1,000 of nitrate of baryta, and 175 of boiled oil. The red composition used for making red flambeaux and percussion signals consists of 1,800 parts of chlorate of potash, 300 of oxalate of strontia, 300 of carbonate of strontia, 48 of whitewood charcoal, 240 of boiled oil, 6 of oil, and 14 of gum lac. A red or white Lamarre flambeau consists of a sheet rubber tube filled with one of the above-named compositions. The lower extremity of this tube is closed with a cork. When the charging has been effected, the flambeau is primed by inserting a quickmatch in the composition. This is simply lighted with a match or a live coal. The composition of the Lamarre quickmatch will be given hereafter. A Lamarre flambeau 1½ inch in diameter and 3 inches in length will burn for about thirty-five minutes. One of the same length, and ¾ inch in diameter, lasts but a quarter of an hour. A fire ball consists of an open work sack internally strengthened with a sheet iron shell, and fitted with the Lamarre white composition. After the charging has been done, the sphere is wound with string, which is made to adhere by means of tar, and canvas is then wrapped around the whole. Projectiles of this kind, which have diameters of 6, 8, 11, and 13 inches, are shot from mortars. The illuminating grenade (Fig. 13) consists of a sphere of vulcanized rubber, two inches in diameter, charged with the Lamarre white composition. The sphere contains an aperture to allow of the insertion of a fuse. The priming is effected by means of a tin tube filled with a composition consisting of three parts of priming powder, two of sulphur, and one of saltpeter. These grenades are thrown either by hand or with a sling, and they may likewise be shot from mortars. Each of these projectiles illuminates a circle thirty feet in diameter for a space of time that varies, according to the wind, from sixty to eighty seconds. The percussion signal (Fig. 14) consists of a cylinder of zinc, one inch in diameter and one and a quarter inch in length, filled with Lamarre red composition. It is provided with a wooden handle, and the fuse consists of a capsule which is exploded by striking it against some rough object. This signal burns for nearly a minute. Belgian illuminating balls and cylinders are canvas bags filled with certain compositions. The cylinders, five inches in diameter and seven in length, are charged with a mixture of six parts of sulphur, two of priming powder, one of antimony, and two of beeswax cut up into thin slices. They are primed with a quickmatch. The balls, one and a half inch in diameter, are charged with a composition consisting of twelve parts of saltpeter, eight of sulphur, four of priming powder, two of sawdust, two of beeswax, and two of tallow. They are thrown by hand. They burn for six minutes. Illuminating kegs (Fig. 15) consist of powder kegs filled with shavings covered with pitch. An aperture two or three inches in diameter is made in each head, and then a large number of holes, half an inch in diameter, and arranged quincuncially, are bored in the staves and heads. All these apertures are filled with port-fires. 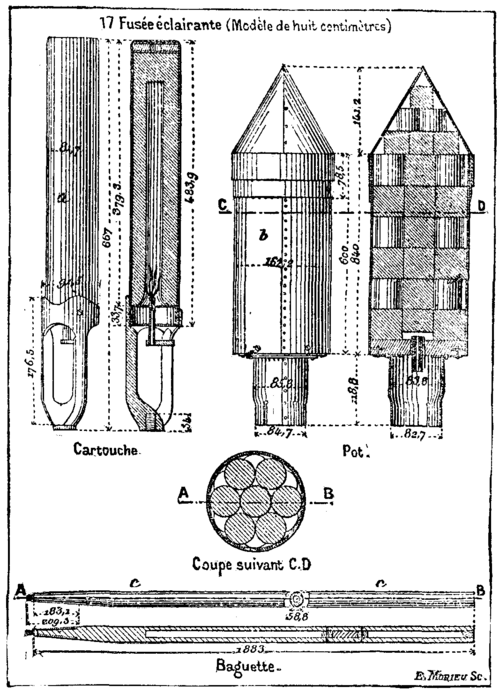 The illuminating rocket (Fig. 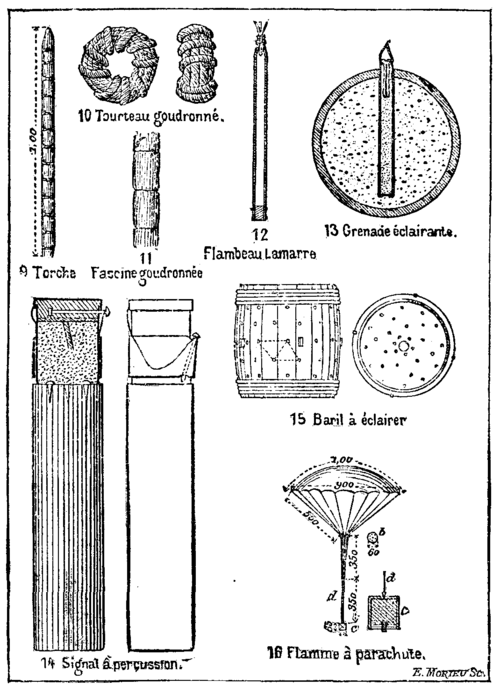 17) consists of a sheet iron cartridge, a, containing a composition designed to give it motion, of a cylinder, b, of sheet iron, capped with a cone of the same material and containing illuminating stars of Lamarre composition and an explosive for expelling them, and, finally, of a directing stick, c. Priming is effected by means of a bunch of quickmatches inclosed in a cardboard tube placed in contact with the propelling composition. This latter is the same as that used in signal rockets. As in the case of the latter, a space is left in the axis of the cartridges. These rockets are fired from a trough placed at an inclination of fifty or sixty degrees. Those of three inches illuminate the earth for a distance of 900 yards. They may be used to advantage in the operation of signaling. A parachute fire is a device designed to be ejected from a pot at the end of the rocket's travel, and to emit a bright light during its slow descent. It consists of a small cylindrical cardboard box (Fig. 16) filled with common star paste or Lamarre stars, and attached to a parachute, e, by means of a small brass chain, d.
To make this parachute, we cut a circle ten feet in diameter out of a piece of calico, and divide its circumference into ten or twelve equal parts. At each point of division we attach a piece of fine hempen cord about three feet in length, and connect these cords with each other, as well as with the suspension chain, by ligatures that are protected against the fire by means of balls of sized paper. In rockets designed to receive these parachutes, a small cavity is reserved at the extremity of the cartridge for the reception of 225 grains of powder. To fill the pot, the chain, d, is rolled spirally around the box, c, and the latter is covered with the parachute, e, which has been folded in plaits, and then folded lengthwise alternately in one direction and the other. The parachute port-fire consists of a cardboard tube of from quarter to half an inch in diameter, and from four to five inches in length, closed at one extremity and filled with star paste. This is connected by a brass wire with a cotton parachute eight inches in diameter. A rocket pot is capable of holding twenty of these port-fires. Parachute fires and port-fires are used to advantage in the operation of signaling. - La Nature. 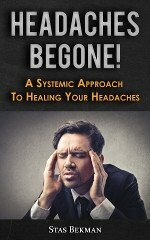 Continued from SUPPLEMENT, No. 583, page 9303.For preparation see page 9304 of SUPPLEMENT.